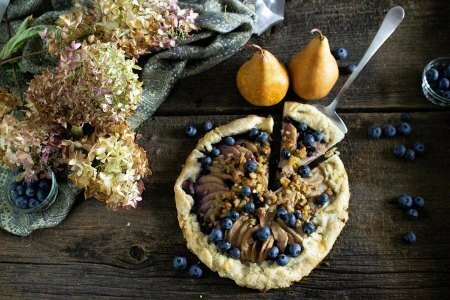 Blueberry, Pear & Walnut Galette in Puff Pastry is Easy & Elegant! 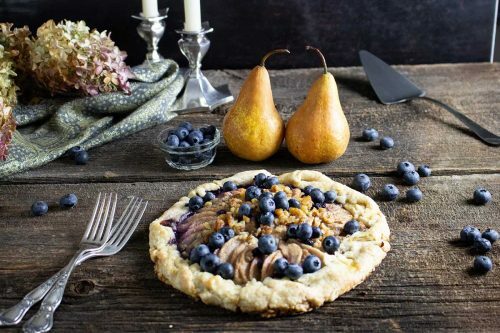 Rustic Pear Galette with Blueberries looks so elegant, your guests will think you’ve spent hours slaving in the kitchen! Well you can always dust a little flour on your nose, just for effect you know? 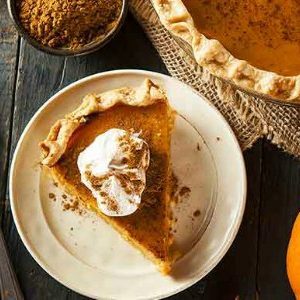 I will share this amazing recipe with you, including a link to an amazing pie crust video (now don’t be scared) making pie crust is dead easy. Then all you have to do is slice up some pears, toss in the a bowl with sugar and spices and voila! 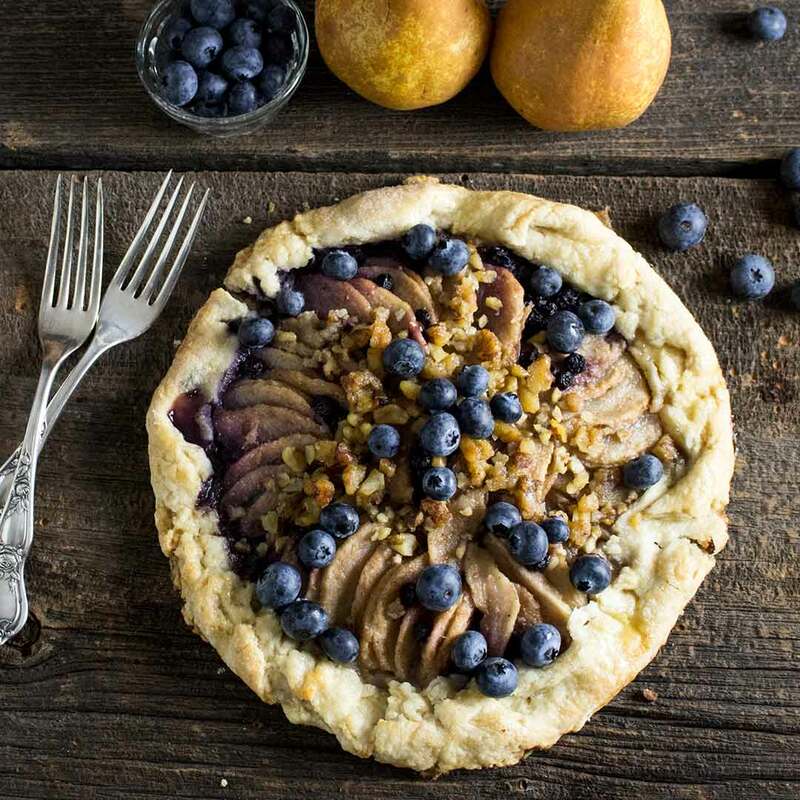 Your very own Rustic Pear Galette with Blueberries. It’s a showstopper, I promise. 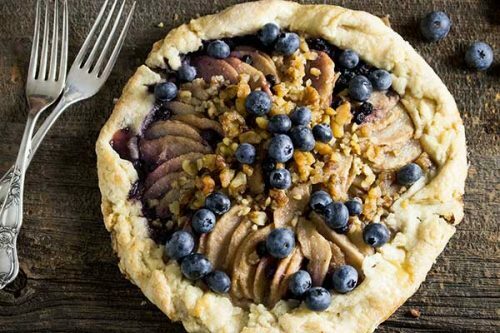 You will need: recipe for a one crust pie (see video below) all purpose flour, butter, salt, bosc pears, walnuts, frozen blueberries, brown sugar, cornstarch, nutmeg, ginger & one egg. Caramel sauce, and white sugar for garnish. 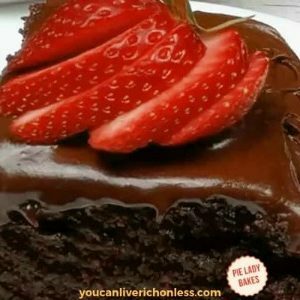 This yummy combination of sweets will make your taste buds sing! And it’s so easy to put together, the only waiting time is while it bakes. The first time I made this galette I used frozen puff pastry. But it just doesn’t have the right texture for me. We want buttery, flaky pie crust, just like Mom and Grandma used to make. Am I right? And the beauty of making a Galette rather than a traditional pie, is that you just fold over the edges, pinch them together with your fingers, and cook the whole thing on parchment paper on a cookie sheet. No fussing about getting the pie dough centred on the plate, fluting the edges — nothing like that at all. 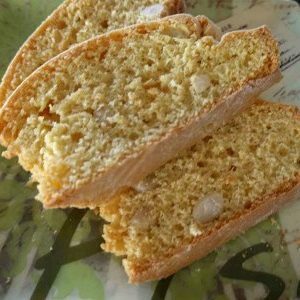 It really a rustic tart, and once you’ve made this recipe, you will be ready to experiment with different fillings. 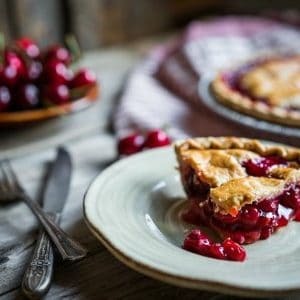 I love to make Apple Galettes, and Cherry too! Whatever your imagine brings to the table. That’s my gift to bakers everywhere. Baking is totally creative and very left brain so the sky’s the limit! A galette is a free formed pie, so to speak, and originates in France, hence the name. 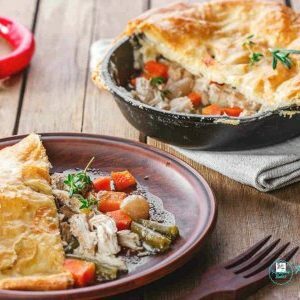 In addition to dessert galettes, savory types are very popular too, and usually include lots of delicious cheese, vegetables and often meat. Like a free-formed quiche perhaps? And instead of using a pie plate, it bakes on a cookie sheet. Easy as Pie! 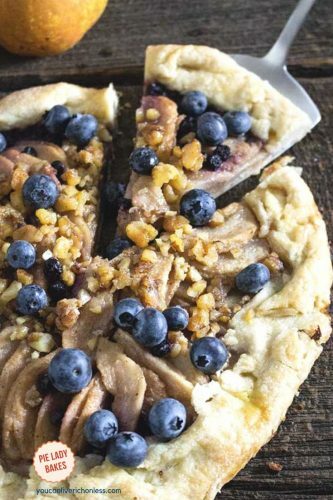 For this recipe I used Bosc pears, blueberries, chopped walnuts, and brown sugar….well the recipe is below. And my secret sauce? I love to pour warm caramel sauce over the galette just as I serve it. The recipe for the caramel sauce is here. The baking time and temps are for a regular household oven. Be sure to check your oven from time to time to make sure it is calibrated. 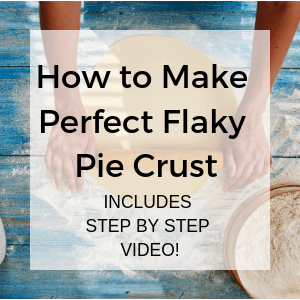 You can read about the importance of oven temperatures and times here in my How to Make Perfect Flaky Pie Crust. Fold over the pie crust as shown in the photos, the more uneven it looks, the better! The following are affiliate links. 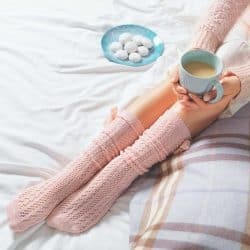 We are a participant of the Amazon LLC Associates Program, an affiliate advertising program designed to provide us with a means to earn fees by linking to products sold on Amazon.com/Amazon.ca and affiliated sites. Thanks for being part of You Can Live Rich on Less! I mentioned the Dough EZ rolling mat and if you’ve watched my videos you’ve seen it in action. This product is worth it’s weight in gold, and I use it to roll out all of my pie crust now. You can buy it here, and get it shipped right to your home to start using it! It rolls up and stores away easily, and washes up like a dream. 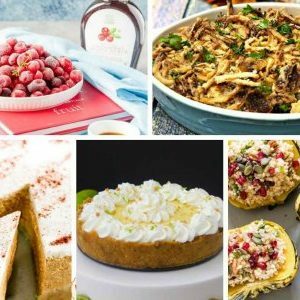 You might also enjoy these amazing recipes that are perfect anytime, but especially so during the holidays! 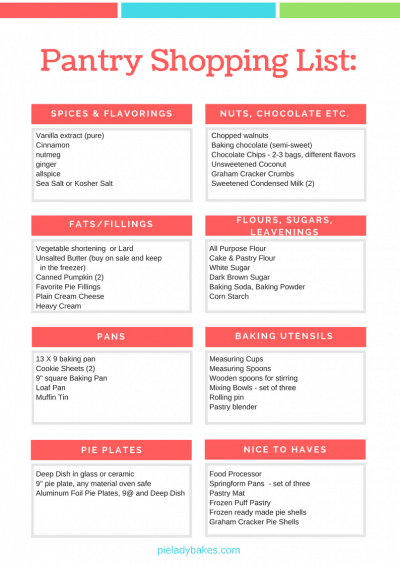 Homemade Butter Tarts – my Grandma’s recipe! 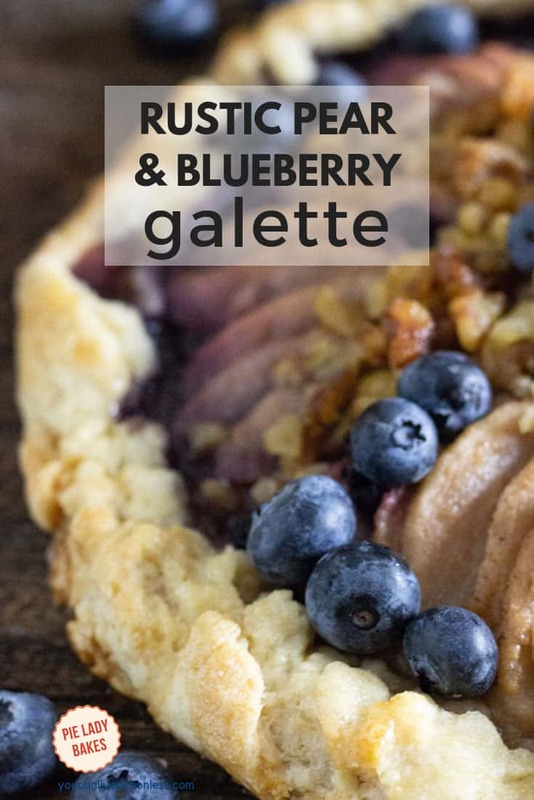 Here is another delicious galette that I would encourage you to try! Easy Summer Fruit Galette by Rock Recipes is not only beautiful to look at, but so delicious to eat. I’ve made several Rock Recipes and the quality is amazing. 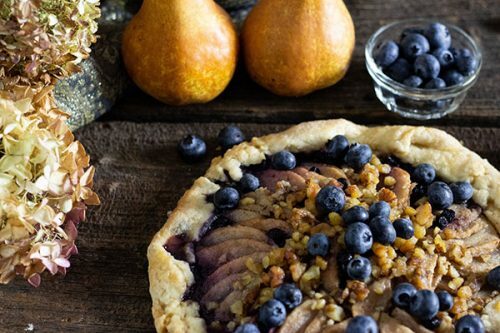 The flavors of the Bosc Pears mixes with the tartness of the blueberries. The brown sugar and spices covering everything make your mouth very happy indeed. And all of that goodness nestled in a buttery, flaky, melt in your mouth, pie crust. 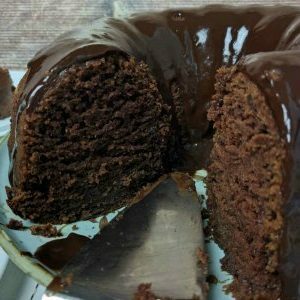 Galettes are so amazing to make, and like I said earlier, not only will you impress your family and friends, you will make this decadent dessert over and over. Can’t you just see it on your dining room table, with lighted candles, and china, just waiting to be served? Or maybe on the kitchen island, with the kids jumping up and down, waiting for a slice. 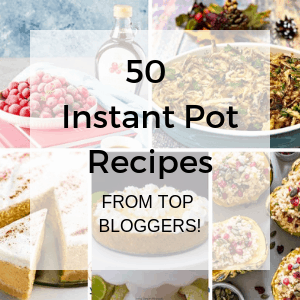 If you like this recipe (and I know you will) please give it a 5 star rating. A delicious blend of Bosc Pear, Blueberries and Walnuts make the filling for this free form galette. 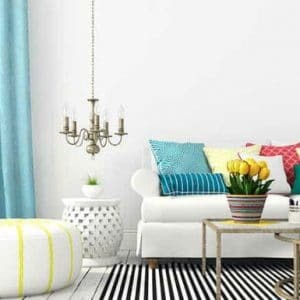 Easy to make yet so elegant! Brush the puff pastry with the beaten egg, and then sprinkle the entire pie with white sugar - just a teaspoon or so! Remove and let cool for a few minutes before you move it onto a rack. Serve warm with whipped cream, and caramel sauce! Bon Appetit! Have you tried to make a galette? Let me know in the comments below! 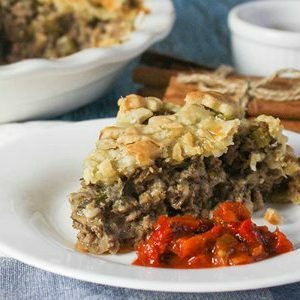 Love the combination of flavors in this tart, it sounds wonderful! This galette looks delish. Perfect for fall. Thanks Ali! It is and really quick to make too.